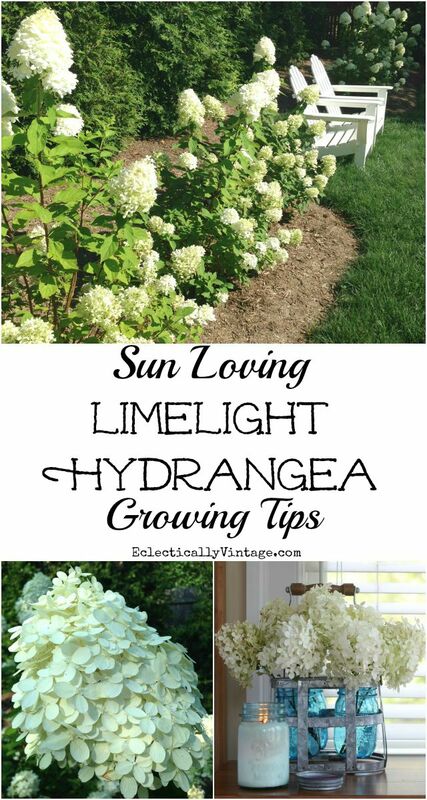 My Limelight hydrangea growing tips tell you everything you need to know to grow these beautiful, sun loving perennials in your garden. As you may have guessed, I have a thing for hydrangeas. If one hydrangea is good then 22 hydrangeas are better. So when I decided to take the very back of my back yard from drab to fab, I knew that hydrangeas would be in the picture. Luckily, I have a friend with an amazing green thumb and he drew me up a landscape plan that included Limelight hydrangeas. Planted just a few short months ago, my seven Limelights have almost tripled in size and have the biggest blooms. Update: See how huge they grew and the most stunning Limelight hydrangea hedge after a few years in the ground HERE! Pruning – Limelights bloom on new wood (see my post on When to Prune Hydrangeas so they Bloom) which means you can cut them and they will still bloom that season but it’s best to prune in fall or winter so you don’t cut off new buds in the spring. 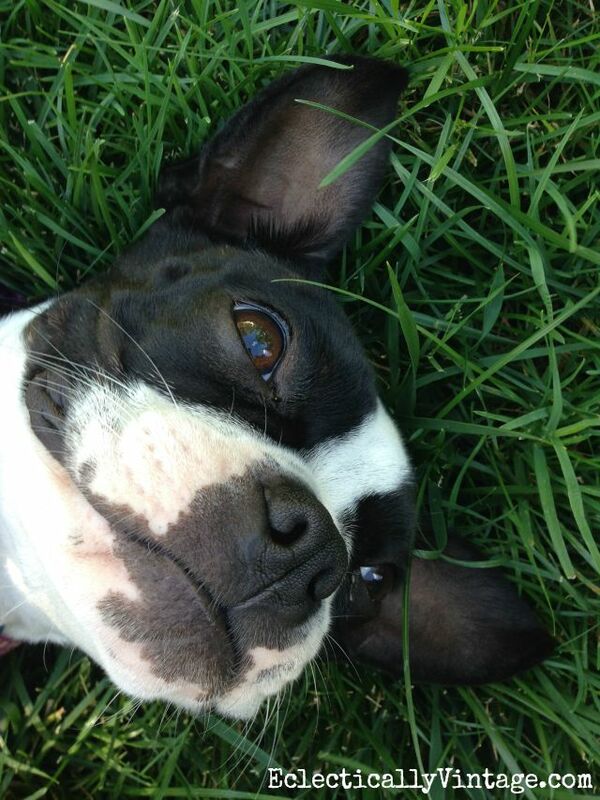 Sushi enjoys frolicking in the grass and staring up lovingly at the Limelights. 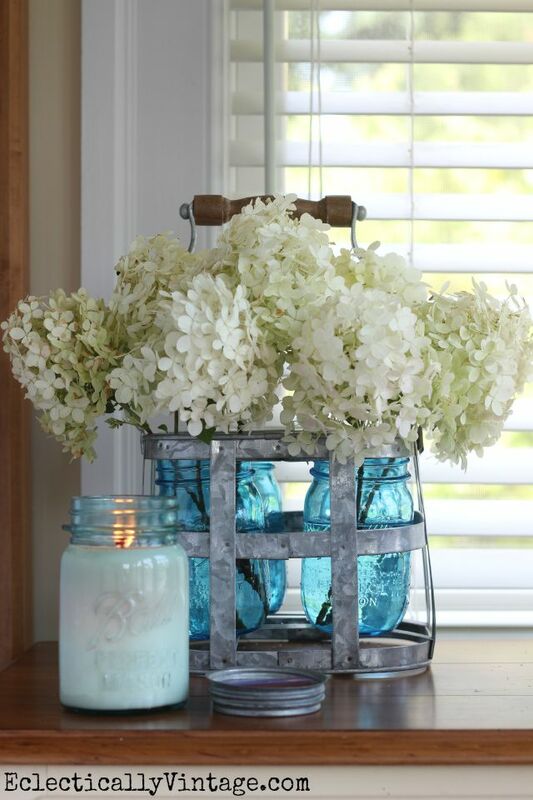 There’s nothing better than bringing armloads of hydrangeas inside and I love getting creative with vases like this bottle carrier from HomeGoods that I filled with blue mason jars. it’s 5 o’clock somewhere after all. « Previous: Life’s Too Short for Bad Sheets! Gorgeous yard and your limelights look great in the blue mason jars! Thanks for sharing your tips! I have severe hydrangea envy….mine have not bloomed for 2 years now…when I used to have hundreds and hundreds of blooms…crossing my fingers for next year….your Limelights are gorgeous!!! And you have a great garden mentor!!! So pretty – love this post. We have one white hydrangea tree & one plant in a pot – both of them the white blooms turned green second year in a row – the tree a light green & the potted one a deep green, almost the color of the leaves. It’s perplexing. But they are still so pretty. I dream of having them overtake my yard one day. Thanks so much Kelly – there is a lot of great info there! I think they can be planted in the fall Marlene! Then you’ll have blooms in the spring! They are – I can’t wait til they are 8 feet tall! Enjoy your Everlastings Cindy! I love hydrangeas too! I have a lime light tree in a pot on my patio that is in bloom and is absolutely gorgeous. Thanks for posting the helpful growing and drying links. Wow! 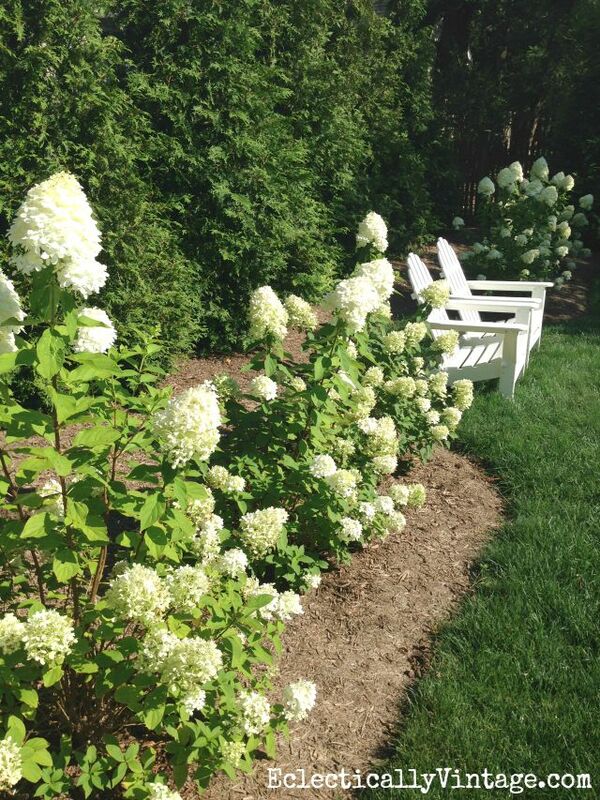 Good choice in planting limelight hydrangeas. They are a show stopper. I love little Sushi. So adorable. The cut hydrangeas look great the way you have them displayed. I have a hydrangea corner in my backyard and limelight outperforms all of them! Mine is 8 feet tall and filled with blooms that we’ll be using for a weeding in a few weeks. 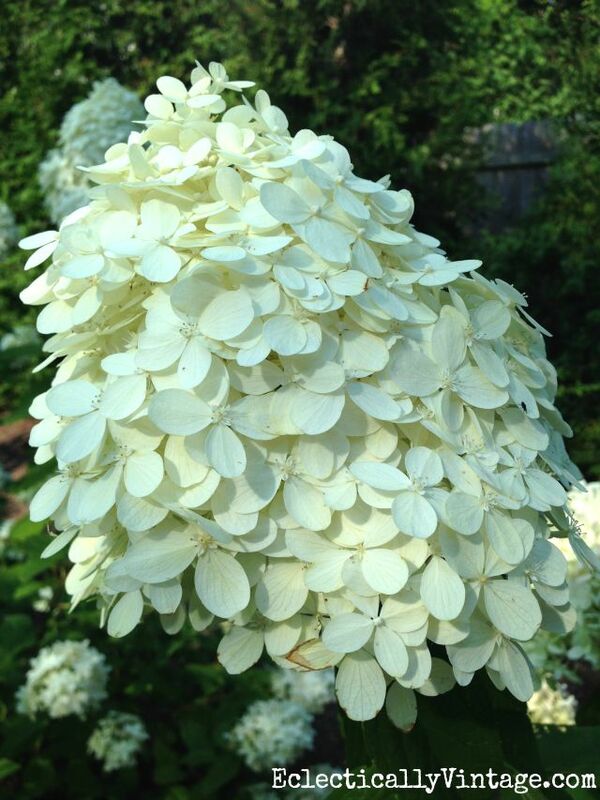 Kelly, have you also seen how gorgeous the incrediball hydrangea is? My sister gave me one last year and this year it’s filled with blooms. It’s just as reliable as the limelight. The blooms are round and huge! It’s been blooming since June and I’m still getting more blooms! WOW – I can’t wait for mine to get that big! I’ve never seen the Incrediball – I will definitely check it out – it sounds amazing! Enjoy the wedding – I’m sure those Limelights will be a showstopper! I have a Blue Nikko Hydrangea that has not bloomed for three years. When it did bloom the flowers were more of a green color. I do know that the soil has to be right for the color to be blue but why hasn’t it bloomed? The plant itself looks great but NO FLOWERS! Catherine – oh no! Did you read my post (linked in this post) When to Prune Hydrangeas so they Bloom! The first year someone hacked down my hydrangeas, I got no blooms, this is my second summer with maybe 5 blooms on 10 bushes! Since Nikko Blue grow on old wood, cutting them down means they won’t bloom and it could take a few years to get the blooms back. Hang in there. PS I almost murdered the guy who cut my hydrangeas! I fell in love with hydrangeas over the last couple of years after thinking they are so old fashioned most of my life. Now I’m hooked. They are the most incredible summer bushes ever. I bought Shooting Stars for the white… and love yours more. I’ll have to check out Shooting Stars – so many gorgeous varieties – so little room in my yard! They are just beautiful. What time of year is best for planting Limelight Hydrangeas? Hi Heather – spring is best and fall would be second best. Limelights are my favorite! I have about 7 of them that give me glorious blooms all summer. I’ve hesitated to use them for cut flowers as I do with my Endless Summers, for fear that they would not keep creating flowers. So, when you cut them for vases, you cut on the woody part of the stem? And does that stem then create another bloom? Or does the rest of the shrub compensate by creating more blooms? I am afraid too much cutting for vases would leave my shrubs looking bare and flowerless. HI Allison! I just planted them last year so I’m waiting to see what happens. I did cut blooms last summer but tried to take them from all parts of the plant – not just the top. I’ll report back after I see how they bloom this year! I have always loved Hydragenias and this Spring am starting to plant them. I have always had gardens full of them but we moved a while back and it has tsken me 4 years to get my landscaping and beds cleared and good soil placed in them and then planted trees and shrubs and now am ready to do my blooming plants. Love Pinterest and all the great landscaping information. Your hydreganias are lovely and I will add them in my landscape in early Spring. Thank you! Thank you Dianna – your garden sounds lovely! Enjoy! None of my hydrangeas bloomed this year. This is the first year my limelight has not bloomed. My other hydrangeas have not bloomed in 2 years they use to be beautiful pink. Now nothing. I have put miracle grow on them. I thought they were fairly self sufficient . What can I do? I need your help!! I have three questions to ask you about my Endless Summer hydrangeas. They have obviously been affected by winter kill, as there is not a bud to be found anywhere on them. I am beyond sad that they won’t be blooming this year. 3) How do I tell the difference between live and dead canes? Your dog is adorable!! My husband and I have Miniature Schnauzers! Hi Karen – did you read this post I wrote: https://www.kellyelko.com/winter-kill-hydrangeas-care/ I show pics of the dead canes – hope that helps! My Endless Summers have buds and some green leaves at the base but my regular hydrangeas have nothing! I’m waiting to see what happens (they usually have leaves but no blooms in past years). PS: The info on the Hostas was appreciated too. I’m so glad Linda – it can be so frustrating when there are no blooms! Great info! I love my Limelights and they grow like crazy! Old wood hydrangeas are another story. We have had spring frosts the past few years so mine haven’t bloomed in awhile. Crossing my fingers for next year! Excellent hydrangea posts! I have a couple of questions perhaps you can help me with. I have two paniculatas I just planted this year. They are blooming beautifully, but the stems are flopping over which seems contrary to how everyone is saying they grow. Any suggestions? Also, can a paniculate’s color be changed to blue if I acidify the soil? My limelight hydrangeas tend to flop as well because the flowers are so huge! It’s pretty common – you may want to prune them in the fall. I’m not sure if they can change color but I think they can. Good luck!